Mary Bichner is a composer, orchestrator, and performer whose opera-in-progress, The Memoirs of Antonina, will have a special concert reading at Central Square Theater (Sep 2, 2018, 7 PM, free but reservations required). We asked the artist about her unique musical mind, the support she’s earned from funders and organizations, and what’s next in her intriguing and colorful journey in music. You have several unique attributes connected to your musical mind, namely perfect pitch and a phenomenon called synesthesia. How do these facets affect your composition process? I call them my “musical superpowers” and will often use them as icebreakers at parties! My sound-to-color synesthesia, which causes me to “see” splashes of specific colors when I hear their corresponding pitches sounded, comes in especially handy when composing. I am drawn to working on projects that feature a strong visual component (live theatre/dance works, films, site-specific compositions, etc. ), and use my synesthesia to select the notes and chords that best “match” the color palette of the visual inspiration for each piece. Recent commissions in the style include serving as composer-in-residence at the beautiful Mount Auburn Cemetery of Cambridge, MA (for this project, I wrote twelve chamber orchestra pieces inspired by the colors found in various location around the cemetery, which you can download for free); and creating a new song cycle inspired by constellations found in the New England night sky for the Boston Museum of Science’s Charles Hayden Planetarium, which were paired with synesthesia-inspired visuals created by the planetarium’s award-winning team (see photos/videos from this event). Spring and summer, most definitely! I’m so sad that the warm weather is almost over! You’ve received grants from organizations like the Somerville Arts Council and Iguana Music Fund, and you’ve had (or have upcoming) numerous composer residencies. What forms of support have been most important to your work? I am extremely thankful for all of the many organizations and individuals that support artists and the arts! The gifts of time, space, and funding that they so generously share with us make all the difference in the world when it comes to creating new work – none of my musical projects in the past three years would have been possible without the support of wonderful institutions such as the Mass Cultural Council, Marble House Project, The Helene Wurlitzer Foundation, Friends of Mount Auburn, The Somerville and Watertown Arts Councils, The Iguana Music Fund, and many more. I am so grateful to them! I am honored to be traveling to the Helene Wurlitzer Foundation of New Mexico in September for a three-month composer residency, where I will be finishing the composition and orchestration of The Memoirs of Antonina. I’ve also recently teamed up with a group of incredible scientists at MIT who are creating a synesthesia visuals device for me to use in live performance, which we will be premiering in concert next year. Finally, it is a dream of mine to compose a new narrative ballet for an orchestral ballet company, and I’ve created an online proposal for the project featuring my work samples, resume, and testimonials from previous long-term collaborators. Very excited for it all! The Memoirs of Antonina by Mary Bichner will have a free concert reading on Sunday, September 2, 2018 at 7 PM (RSVP Online). 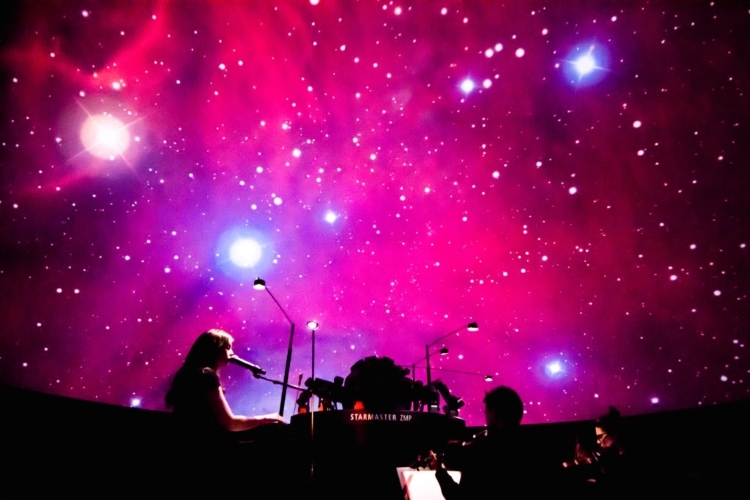 Image: Mary Bichner performing SYNESTHESIA SUITE: CONSTELLATIONS at Boston’s Museum of Science, photo by Jonathan Beckley; logo for THE MEMOIRS OF ANTONINA, art by Chess Albaneze.